Brutally honest while heartwarmingly aligned with God, nature, and maternal mindfulness, Walking the Labyrinth of My Heart, takes us on a journey of faith, grief, and hope. Shortly after discovering that she is pregnant with her second child, Dianna receives a prenatal diagnosis of a lethal anomaly that sends her recently balanced world into a tailspin. We watch and root for her as she goes from disbelief, to recognition, to enlightenment. Through insightful journal entries, emails, poetry, and reflections, we see the progress of a pregnancy, the fate of which is largely beyond the author’s control. As a result, Dianna becomes a fierce advocate for the few decisions that are within her control with the most important one being the ability to birth at home. The story is dynamic and open-ended as we experience with Dianna the penetrating pain of the pregnancy and the raw grief that follows the death shortly after birth of her much longed for daughter, Mary Rose. Dianna’s transformation from brokenness to wholeness, from suffering to healing, “turning pain into Light and Love” is a witness to the impact of one tiny baby girl and to the path that they both traveled writing their story together. Walking the Labyrinth of My Heart is a heart-wrenching but hopeful, even joyful journey, that searches for the symbolism that is apparent everywhere if only you open the eyes of your soul to unexpected miracles. This is a deeply moving and spiritual testament to the beauty of unconditional love. It is a must read for anyone who believes or wants to believe that there is a purpose to every life and that priceless mosaics begin with shards of broken glass. This deeply emotional, heart-filled book could only have been written by a mother who has gone through the loss of her baby. This is a jewel of a book that can help other mothers walk this difficult path. May this book help them in their pain. Dianna Vagianos Armentrout writes with the eloquence of a poet and the empathy of a grieving mother. This is a book for all bereaved parents, especially those who come to realize, while the baby is still in the womb, that fatality may occur. If you’ve lost a child, you’ll find yourself gifted with techniques and information to help you through the deepest anguish into a fulfilled life. Moreover it’s a must-read for anyone caring for and loving families who mourn for their children in the spirit world. Walking the Labyrinth of my Heart will sear your heart and inspire your spirit. Dianna’s journey of carrying a child most certainly destined for death, becomes uncharacteristically, a beautiful story of hope and faith. 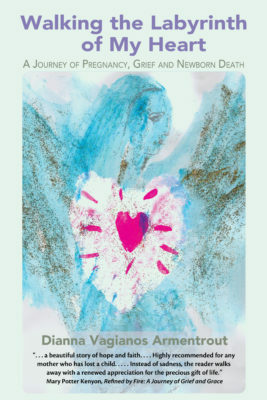 Highly recommended for any mother who has lost a child, this book is inspiring for anyone who has grieved a loved one. Instead of sadness, the reader walks away with a renewed appreciation for the precious gift of life. With Walking the Labyrinth of My Heart: A Journey of Pregnancy, Grief & Newborn Death Dianna gifts us with a book that leads straight into a piercing and necessary truth about death, grief, and life after. She takes us through the process of “finding her footing in the thick molasses of grief” in the same circular way grief took hold of her life. We labor with her through a willed pregnancy after being given the fatal diagnosis. Dianna helps us see that grief when juxtaposed with life creates an opening into our depths. She takes us through her pain with the elegance of someone who has looked into the heart of God, and knows that she is not alone. Dianna eloquently blends her skills as writer, poetry therapist, researcher, and poet to show us the body of what I would call transcended grief. Dianna’s spiritual growth deeply informs her writing and leads us into her world where little Mary Rose keeps blossoming beyond death. This book bursts with creative energy and pain all at once. More than merely expressing her grief, Dianna has written a forceful manifesto for claiming life in the face of pain, death and tragedy. One cannot but be changed by it. All grief is a meditation on the unexplainable. Mourning a newborn daughter, after gestating a baby you know won’t live, is beyond language and understanding. In fact it’s almost beyond breathing. Walking the Labyrinth of My Heart, Dianna Vagianos Armentrout’s powerful book explores the excruciating depths of loss in a tone of elegiac prayerfulness. Perhaps prayerful contemplation is the only hope to find one’s way in the swirling chaos of this kind of loss. We have no choice but to accept death and mourning, but in our hearts we never agree to it. Dianna’s beautiful book, through language and love brings us along this unendurable pathway to as much comprehension as is possible. Dianna Vagianos Armentrout’s memoir is one parent’s account of receiving a Trisomy 18 prenatal diagnosis for a much-wanted child. She shares how to navigate the necessary medical arrangements when there is a life-limiting condition, and addresses common obstacles that families encounter during the prelude and aftermath of Trisomy 18 deliveries. What makes Dianna’s story especially compelling is the unique blend of religious and spiritual traditions, poetry and readings that guide her through her pregnancy, birth and the grief journey that follows. our entire worldview about life itself and faith, and the way we speak to others about their own experiences of life and death. She also shows us that in the telling one’s own story there is healing, even when the child’s life is a brief flash of light. Nothing could have prepared Dianna Vagianos Armentrout for the multifaceted and deeply painful experience of losing her newborn baby. Her story, honest, emotional and at times raw, stimulates one’s own memory of pain. Walking the Labyrinth of My Heart is a courageous memoir guiding the reader on a personal journey through the many stages of grief. While the devastation she feels is palpable, the love for her child and continued connection to her beautiful spirit shines through each page. Her poignant insights into the message of loss reveal an opportunity to heal and the chance to mend a broken heart. There are many tragedies in life; this one created a book reminding us of how precious life is, no matter how short it might be. This is a searing and wise telling of one woman’s journey through the most difficult landscapes of faith and grief. Dianna Vagianos Armentrout writes with such honest and tender sadness that her words eventually merge with light. The story of the birth and death of Mary Rose will stay with me for a very long time. “I insisted on making my own way through a system that doesn’t offer many choices.” “Mary Rose focused me, broke me open to love more . . . In our tiny fragment of time together, there was profound truth and mercy.” In Dianna’s Walking the Labyrinth of My Heart, the glaring hypocrisies and platitudes of society, religion and culture toward parenting, pregnancy, infant death and grief are all observed in such an honest and provocative way, that one does not merely read this book, but experiences it, and is left captivated, wounded, marveled for the treachery that is the bereaved parent’s sojourn. That we have established a universal and systematic sterilization of grief is pointedly called out, time and again, and evaluated through a raw candor and impossible wisdom. Such a writing is divinely inspired, a balm and real hope for any bereaved mother’s heart, and is quite frankly a necessary guidepost of observations and lessons for every member of society. We have been parched for such truth; we have been in danger without it. I am a bereaved mother, and if you consider yourself part of my village, my community, my society, I must ask that you read and heed the value of Dianna’s journey. Dianna Vagianos Armentrout’s unforgettable debut book, Walking the Labyrinth of My Heart, firmly establishes her as a master of courage and faith. Her deeply felt passages leap off the page and into the reader’s heart. Like any great artist, she turns her human experiences into a work of art that is soul searching, honest and powerfully moving. The poet’s strong female voice rises above the grief of carrying to term a child she knows will not live long and illuminates the “raw and holy” one-hour they shared in this physical world together. She lines her path, through the labyrinth of anguish and heartache, with roses, fully knowing her heart will be punctured by thorns. She is the holy chalice at the center of this labyrinth brimming with unconstrained truth and sorrow yet joyous and thankful for the cadre of women who supported and surrounded her with love. With the exquisite showcase of talent displayed in this book honoring Mary Rose, the author celebrates her daughter’s life, no matter how short, with the certain knowledge that love never dies. A powerful book that shares wisdom and comfort, love and beauty as it confronts the most unimaginable of losses. I have long admired Dianna Vagianos Armentrout as a poet and poetry therapist. Here she invites us to walk beside her on the labyrinthine path of a mother’s grief. Here her great heart, soul, intelligence, spirit, prayer and poetry bring light to darkness and healing to suffering.